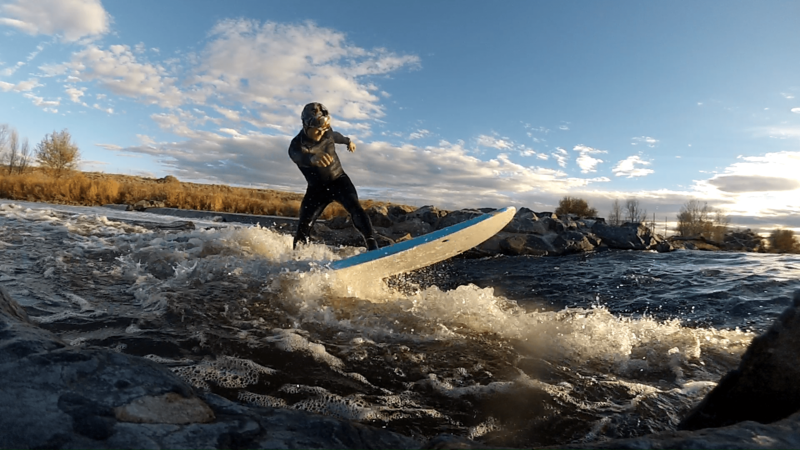 Late in the season, Dave’s Wave can be the only low flow surf option in the Denver area. And I mean low; down to 130 or 150 cfs or so on the Henderson gauge, if you have a board with enough volume and small enough fins. It isn’t particularly high performance, but with decent water you can move around on it, and it certainly allows for more options than something like the 16th Street wave at similar flows. Note that you can’t run much in the way of fins when its low; bring the smallest ones you have if you’re groveling here. It isn’t quite roadside; once you arrive at the Thornton Gravel Ponds fishing parking lot, you’ll need to walk about a half mile to the wave itself. The water is also treated wastewater; it doesn’t smell great, but it generally isn’t any worse than the rest of the South Platte. I like the Taquito or the IRS for this wave; at least at low flows. You’ll want something with volume until it gets high. There are two gauges down in this area; the first is run by NOAA and can be found here, but ignore that one, it isn’t accurate. The second gauge is operated by the Colorado Division of Water Resources, and can be found here – it’s the one you want. Note that you’ll see pretty significant flow variations during the day; when it’s Dave’s season (late summer, early fall) sunset surfs provide the best flow. The gauge is 5 miles or so downstream of the wave, so you’ll feel flow changes at the wave first. Park at the Thornton Gravel Ponds fishing area and the walk the river trail (far side of the fence, not the near side) upstream for about half a mile until you see the wave and weir in the current. It’s pretty obvious (though slightly less obvious than it used to be, now that they’ve removed the overlook structure). In the winter you’ll add another half mile to your walk due to the winter closure of the lower parking lot.